Billing records in the TelexFree bankruptcy case show that advisers to court-appointed Trustee Stephen B. Darr held an hour-long teleconference with McGuireWoods, counsel to Zeek Rewards’ receiver Kenneth D. Bell. This appears to mark the first time that Zeek’s name has surfaced in TelexFree-related court matters. The two cross-border MLM/network-marketing fraud schemes allegedly gathered a combined sum approaching $3 billion. Each scheme operated for only about two years. The conference took place on Nov. 6, 2014. Precisely what was discussed was not disclosed, although the records suggest Darr’s advisers were studying the claims form used in the Zeek Ponzi- and pyramid case. Participants included Mesirow Financial Consulting LLC and McGuireWoods. Mesirow, which provides accounting and financial services, has assisted Darr in the mammoth job of reverse-engineering the alleged $1.8 billion TelexFree cross-border fraud scheme. McGuireWoods has provided litigation counsel to Bell, who has sued Zeek vendors and thousands of individual participants who allegedly profited from the $897 million cross-border scheme shut down by the SEC in August 2012. McGuireWoods is not providing legal counsel to Darr. That duty has been undertaken by Murphy & King (M&K.) Still, there may be lessons to be learned from the Zeek litigation. On Nov. 7, 2014, a day after the conference, two of Darr’s advisers at Mesirow noted “research regarding MLM payment schemes and Zeek rewards” in billing records. Separate records in the Zeek-related cases show that Bell had studied litigation flowing from the $119 million AdSurfDaily cross-border Ponzi scheme broken up by the U.S. Secret Service in 2008. Bell has raised concerns about “serial” MLMers/network marketers moving from one fraud scheme to another. Such schemes raise the prospect of a black market and back-alley deals infecting the legitimate commerce stream. It has been a concern in the TelexFree, Zeek and ASD cases. The screen shot below is taken from Mesirow’s first interim application for payment for assisting Darr in his TelexFree probe. In court filings, the U.S. Department of Homeland Security said an undercover agent joined TelexFree by paying a promoter directly. Billing notes by Mesirow say the firm analyzed “reports related to Colombian investigation” and that Mesirow is aware of a “Colombian creditor claiming $3MM.” In September 2014, the PP Blog reported that TelexFree President James Merrill claimed at a 2013 TelexFree event in California that Colombia “feared” network marketing. The California TelexFree event may create a tie with Zeek, the Blog reported in April 2014. In 2010, the U.S. government established ties between a Colombian MLM “program” known as D.M.G. Group to money-laundering in the United States to conceal narcotics profits. DMG’s membership ranks swelled to more than 400,000, with the scheme capturing hundreds of millions of dollars. The pyramid collapsed in 2008 — but not before [David] Murcia and others had set up an international money-laundering operation that routed narcotics proceeds through Mexico and concealed the criminality in real estate and other holdings in the United States, prosecutors said. “The so-called ‘Bernie Madoff of Colombia’ now stands convicted of money-laundering in Manhattan federal court,” said U.S. Attorney Preet Bharara” [of the Southern District of New York]. Mesirow’s billing notes also reference an ongoing investigation in Brazil into TelexFree activities through an affiliate known as Ympactus. The shutdown by Brazilian authorities of Ympactus in the summer of 2013 “was the first of many indication that the Debtors were operating an unsustainable pyramid scheme,” Mesirow said. In its first billing, Mesirow said it has assisted Darr in recovering more than $17 million since the firm was formally appointed to assist the trustee on July 14, 2014. Mesirow is seeking about $1.6 million in fees for more than 2,962 hours of work, plus reimbursement of expenses of $20,942. Read the Mesirow application and billing notes, which reference TelexFree figures such as Merrill, Carlos Wanzeler, Carlos Costa, accountant Joe Craft and MLM Attorney Gerald Nehra. 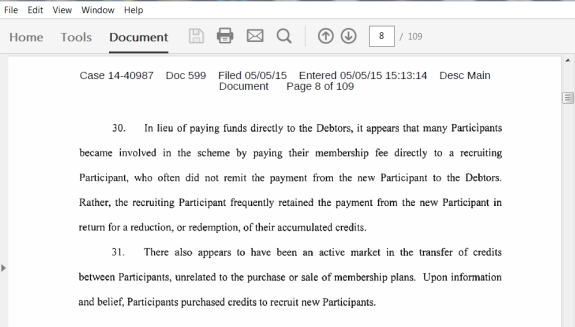 M&K, legal counsel to Darr, also has submitted a billing application with notes that reference Zeek Rewards. M&K, like Mesirow, joined with the trustee in July 2014. M&K is seeking more than $1.3 million, saying it has expended more than 2,784 hours. It also is seeking reimbursement of expenses of $36,116. There are other Zeek references, plus references to other Ponzi cases.